Bangkok: Traffic clogged roads out of Bangkok on Friday as thousands of people fled ahead of a high tide expected to worsen floods that have inundated factories and prompted foreign governments to warn citizens to stay away from one of Asia’s biggest cities. Thailand’s worst flooding in half a century, caused in part by unusually heavy monsoon rain, has killed 377 people since mid-July and disrupted the lives of nearly 2.2 million, until now mostly in the north and central provinces. Prime Minister Yingluck Shinawatra said she was considering a proposal to dig channels into some roads in eastern Bangkok to drain water into the Gulf of Thailand, an idea backed by the chairman of the Thailand unit of Toyota Motor Corp whose factories have been badly flooded. “We need to look into several details on whether it works," Yingluck told reporters. The Meteorological Department warned residents living along the Chao Phraya they could face rising waters. Roads around the Grand Palace, a top tourist attraction, are partially flooded along with some streets in densely populated Chinatown. On Friday morning, on a street in front of the Grand Palace normally bustling with tourists, a two metre snake was caught by a motorcycle taxi driver. Residents have also had to contend with crocodiles escaping from flooded farms. In the riverside shantytown of Bang Phlad, small wooden homes were knee-deep in foul-smelling water with rubbish floating on the surface. Residents carried belongings above their heads, struggling against the current of water pumped back out to the river. Tem Kaewkeow, 73, sat on a pile of tyres, staring at the blank screen of a half-submerged television set. “Everything is damaged, but what can I do? This is the force of nature," he said, shirtless and sipping on water he had boiled on a small gas stove. “I don’t plan to leave. This is my home." 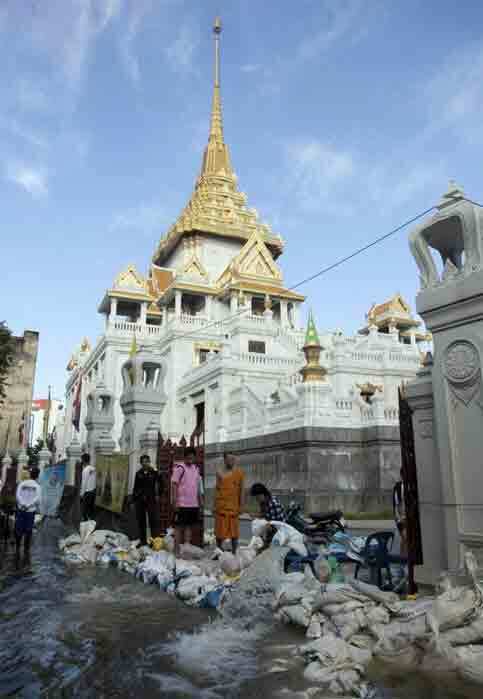 At the district’s Yanhee hospital, two dozen emergency room doctors and nurses shovelled sand into sacks to fortify a one-metre wall protecting the building as water levels rose in a nearby canal brimming with trash. “Everyone here is working around the clock to protect the hospital," said Dr Supot Sumritvvanitcha, the hospital’s chief executive. “We’re using trucks, motorbikes and boats to get help to people. Yesterday, we brought a pregnant woman here by boat to deliver a baby." 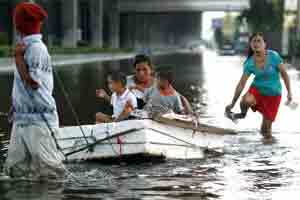 Bangkok governor Sukhumbhand Paribatra told reporters late on Thursday that floodwaters might overflow embankments. “I’ll continue fighting and won’t let all of Bangkok be flooded." Yingluck, a novice politician who only took office in August, has said the crisis had now reached a critical point. “It seems like we’re fighting against the forces of nature, massive floodwater that is causing damage to several of our dikes," she said. “What we can do now is to manage it, so that it flows slowly, otherwise everybody will suffer." Yingluck’s government declared a five-day holiday from Thursday to allow people to leave. Roads out of the city to the flood-free south were jammed. Many were heading for the seaside town of Hua Hin and the eastern resort city of Pattaya, where hotel rooms and homes to rent were scarce. Bangkok, a low-lying city of at least 12 million that accounts for 41% of Thailand’s $319 billion economy, is in danger from run-off water from the north coinciding with the high tide on the Chao Phraya, already at a record high level. Deputy Prime Minister Kittirat Na-Ranong said on Thursday he expected job losses of no more than 10% of those employed in the shuttered industrial zones and there would be plenty of work when recovery efforts start. “The government still needs hundreds of thousands of workers for reconstruction," Kittirat told reporters. The government crisis centre said there would soon be evacuation centers in eight provinces that could take in between 100,000 and 200,000 people.